Thank you for your interest in www.lettersofrejection.com. In this site you will find the end result of hard work, great communication skills, vast amounts of experience, or top notch education. Complete and total REJECTION! We are pleased to announce Letters of Rejection was named in USA Today as a hotsite. See for yourself at USA Today. Also, Letters of Rejection was interviewed for a feature on the XM satellite radio show "Life's Work with Lisa Belkin"! The job market is not that good. Well, unless you know someone already working there...or baby sit the hiring managers child. Oh, or you are the best statistic. And let's not forget those who work in the family business, but I bet even your family might reject you if you do not wear a tie for the interview. I would like to see a new form of rejection letter for a job. Something that cannot be misinterpreted, gets right to the point, and will not give any possibilities of false hope. Something as simple as a piece of paper with two boxes on it would do. On top of one is the word YES, and on top of the other is the word NO. The header graphic is a representation of a possible "career seeking" cycle. Begin by seeking & finding the perfect job. Prepare/send your resume and cover letter. Meet the employers and key figures of the Department. Become assured when they tell you your resume will be filed for a year regardless of the outcome of the interview. Say goodbyes. This is the point they tell you about how much of a pleasure it was to interview you & that they will be in touch with you soon. Believing that, you wait by the phone for a call that never comes. 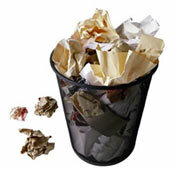 End by realizing the truth: That you did not get the job & your resume is; IN THE TRASH!